Back again (and slightly later than usual) but today we see the team share their thoughts on the adventures so far while Teyla discovers a dark secret about her past. During the preparations for a Wraith attack Rodney comes up with the idea of sending a message back to the SGC using all of their generators, sending information in a single burst such as their situation, information about the Wraith, what they found, and even personal messages. While these are recorded Sheppard and Teyla decide to conduct recon on the exact makeup of the Wraith fleet using a Puddle Jumper, using a friendly planet as a base to launch from. The two come into disagreement however when Teyla’s friends on the planet request evacuation, with Teyla wanting to move them while Sheppard is les enthused about doing so. As they conduct recon in orbit they find that the fleet is much larger than anticipated, with each Hive joined by three or four cruisers, and immediately starts attacking the planet for food. 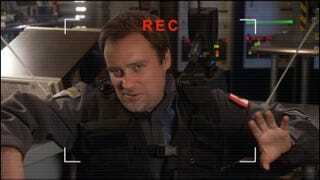 While the Jumper initially tries to go through the Stargate but the Wraith dial in to prevent escape, leading Sheppard to put the Jumper down where they agreed to rescue Teyla’s friends from. On Atlantis Ford takes command of recording everyone’s messages, feeling the need to comment on everyone’s story to their family. The process sees a surprisingly large variety of messages from the crew with Beckett unable to talk sincerely without turning into a blubbering wreck, Zelenka giving away every SGC secret from the last decade in Czech, no-nonsense Sgt. Bates being surprisingly familial, Dr Kavanagh using his to snipe at Weir’s leadership, and Weir having the duty of sending messages of condolence to the families of those who’ve died already. The most surprising message of all however comes from McKay who, after having spent an hour detailing his various scientific accomplishments and dreams along with his life story, asks Ford to wipe everything but the personal message at the end which is intended for his sister. Back on the planet the Jumper begins to wait out the night until the culling is over, forced to witness it first hand. During the night Sheppard leaves to check out a strange beam the Wraith have planted, leaving Teyla to man the Jumper. During the night Teyla begins bringing nearby civilians into the Jumper as a refuge from the culling. When Sheppard returns the Major wants to leave immediately regardless of the status of Teyla’s friends but Teyla convinces him to stay longer, stating that she’d stay regardless of whether he did or not. Eventually Teyla’s friends arrive along with about a dozen others, with Sheppard agreeing to bring them on board as the last of the village is culled. After returning to Atlantis Sheppard is offered the opportunity to record a personal message of his own but declines but does accept Weir’s offer of recording the final message of condolence, the one for the family of Colonel Sumner. The episode ends with Harriman and Carter at the SGC confirming receipt of the message from Atlantis. And here we are with Atlantis’ first (and one of only two if I recall) clip show episodes and it really is a unique entity amongst the franchise. Unlike previous ones from SG-1 which, while having a main plot, didn’t really focus on character views of previous events, this episode instead directly looks at how characters were involved and effected by the previous 16 episodes. The plot largely follows the team as they attempt to warn Earth of the threat facing Atlantis and potentially Earth. Rodney however discovers that the bandwidth available to them gives them the opportunity to record personal messages to Earth for their loved ones. This allows the show to add some much needed character exploration for members of the expedition. It’s honestly quite fun to watch Carson Beckett, who always came across as a bit of a mother’s boy, fail to get in touch with his emotions without falling apart like a child. By far however the best characters of the episode are Rodney and Zelenka. Both of them have completely opposite messages but they’re both quite human in their own way. For the former Rodney desperately wants to be remembered and revered as this great scientist, filling his message with inane rubbish about “leadership”, until he realises that it’s his sister who matters the most and wishes to try and make amends in what might be his last moments. It’s quite a revealing moment for a character who up until now has been rather distant and almost cold in how he conducts himself. In contrast we have Zelenka, very much the human element of the science team on Atlantis, who gives a very fraught and detailed account of the discovery of the city for his family, wanting to share his delight in the Expedition and what it has accomplished in so little time with his family. It’s his sheer delight against what should be classified intel that makes Zelenka a fan favourite already as he doesn’t have the same sterilised or clinical outlook that people like Rodney have when it comes to their purpose on the base. Outside of this we have the storyline with Teyla and Sheppard which follows the more traditional serious story of the clip show episodes. While it doesn’t really add anything to either of the two characters it does function by explicitly showing the effects of a Wraith culling on screen for the first time. Throughout the episode the two members of FART are forced to watch helplessly as hundreds are taken by the Wraith and in the end, despite having rescued a dozen or so, the planet is wrapped in an eerie silence that wraps the whole planet, with it left silent and barren of all life that inhabited it only hours previously. This really serves to show up the stakes at play in the coming battle of Atlantis and succeeds in that goal. This is an episode that breaks with the established formula for clipshows and succeeds at making it stand out in that respect, exploring character motivations alongside the more traditional finale setup. It’s honestly a shame more of these weren’t made. · Ford is once again made supremely unlikable, wanting to basically go “yeah let the children die”. · The start of Rodney’s tape is like the worst War Correspondent of all time. We begin with Teyla waking from a nightmare where a Wraith feeds upon her. In shock she runs to find Sheppard, only to find that it’s another nightmare within the nightmare which she then also wakes from. This seems to be a recurring problem, with Teyla displaying emotional changes such as increased confrontation in her conversations with others of the city. Due to her outbursts Teyla is referred to the Expedition psychologist, Dr Heightmeyer, to try and understand what is troubling her, despite her initial reluctance to go. With the psychologist Teyla reveals that she’s been able to “sense” the Wraith before when they were close and that recently it’s become more constant in presence. When the city personnel are unable to provide answers to her problem they decide to ask the Athosians on the mainland for help. On the mainland Teyla and Beckett try to find information as to what may be causing Teyla’s increased sensitivity to the Wraith. Here they find from one of the elders that at some point in the past a group of humans were kidnapped by the Wraith but then returned, displaying unusual abilities to sense the Wraith and that Teyla is the descendant of one of those who were taken. FART decide to take a trip to the planet on which the original inhabitants were kidnapped from, finding a secret Wraith lab that contains Wraith data storage that Rodney and Weir begin to look into. This data store reveals that the Wraith are descended from the Iratus bug that attached itself to Sheppard in Thirty-Eight Minutes and derive their need to feed from them. The data also confirms that Teyla has a small amount of Wraith DNA in her genome as a result of the experimentation. While Teyla tries to come to terms with her discovery of the DNA tampering the others find out more about the experiments, finding that the attempts to make the humans more edible was giving them the ability to sense other Wraith via the same telepathic field that the Wraith themselves use to coordinate. This gives the team the first potential advantage over the Wraith in a long time and the team decide to ask Teyla whether she’d be willing to try and reach out to the other Wraith and gain intel from them without their knowledge. During the first attempt to communicate Teyla quickly becomes distressed when the Wraith she’s following feeds on a human prisoner, causing Weir to call off the connection. Teyla however is insistent to try again, having seen it work the first time. This second time however the Wraith detect her presence, taking control of her body via the link and using her to send a message to the Expedition before the latter cuts the connection. To make matters worse for the team it appears the link allowed the Wraith to gain information regarding the Atlantis Alpha Site, rendering it useless as a refuge. Despite what happened with the Alpha Site Teyla decides to try the connection once more but is quickly taken over again by the Wraith, who this time use her to attack personnel until Teyla is stunned by Sgt. Bates. Despite the minor injuries to some of the staff Teyla reveals that the Wraith know about Earth and are attacking Atlantis for the sole purpose of reaching the homeworld. This is an episode that was clearly smaller in scale to make way for the finale but that doesn’t damage it as a piece. Instead the episode chooses to explore the background of the one main character who hasn’t been explored that much until now. The story sees the revelation that humans had previously ben experimented on by the Wraith to make them easier to digest but ended up giving them powers as a side-effect. Eventually this led to people like Teyla being able to sense and warn of Wraith attacks before they happen, becoming a threat to Wraith cullings. This bears similarities to the storyline involving Nirtti from SG-1 where the Goa’uld attempted to create better humans, though in that case the superhuman side-effects were deliberate. The team decide to try and use that power to gain more intel on the threat facing them from the Wraith before the attack that is coming soon. While this is an interesting use of the Wraith abilities the part that grips you the most is the fact that this has many negative consequences for the resident Athosian. Not only do the effects of Wraith being nearby cause her serious night terrors and aggression issues but the connection itself is open both ways, meaning that while Teyla was able to grab intel for the team it also gave information to the Wraith for their attack, such as cutting off the Alpha Site before the attack can take place. It’s a great narrative decision that prevents the issue of overpowered plot devices that the show has had trouble with dealing with on the parent show, with advanced armour and devices suddenly disappearing after the episode they appeared in. Here, the viewer is made well aware that the risks of the power mean it can’t always be used. Beyond this not much really happens, with the episode scope being even smaller than the clipshow episode previously, but the focus on Teyla and her new found abilities makes it a tight episode that doesn’t overstay its episode. · Wraith Teyla must’ve taken a lot of time to put together.